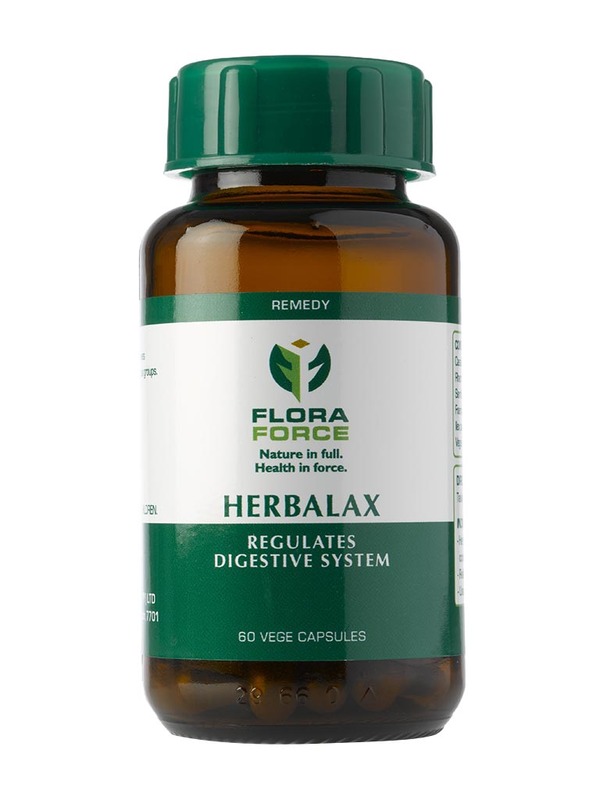 An all-natural laxative to encourage healthy bowel functioning, lessen bloating and improve lazy bowel syndrome. 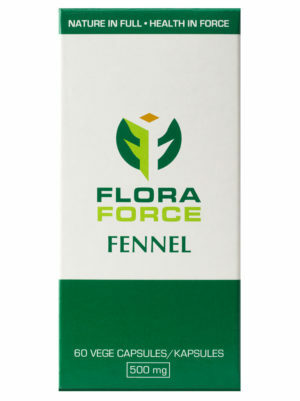 Ingredients: Each capsule contains: 240mg Cassia angustifolia powder, 32mg Rhamnus purshiana powder, 32mg Sambucus nigra powder, 64mg Foeniculum vulgare powder, 32mg Ilex paraguariensis powder. 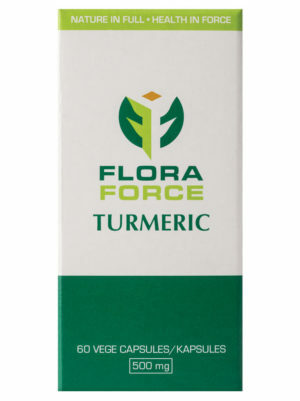 Proprietary name (and dosage form): Flora Force Herbalax Capsules. Composition: Each capsule contains 240mg Cassia angustifolia powder, 32mg Rhamnus purshianus powder, 32mg Sambucus nigrum powder, 64mg Foeniculum vulgare powder, 32mg Ilex paraguariensis powder. Not to be taken by children under 12 years old or generally debilitated subjects. Warnings: Over use of laxatives may cause water, sodium and potassium depletion. Do not take continuously for longer than 14 days. Do not exceed dosage directions. Drug Interaction: concomitant use with other drugs inducing hypokalaemia (thiazide diuretics, adreno-corticoids and liquorice root may enhance electrolyte imbalance. Caffeine containing herb Ilex paraguariensis: should not be taken by patients on monoamine oxidase inhibitors such as isocarboxazid, phenelzine, tranylcypromine as it may cause hypertensive reactions. The hemodynamic effect of adenosine is inhibited by xanthines. The effect of Chlozapine is altered when taken less than 40 minutes after caffeinated drinks. Sedative effects of benzodiazepines, zopiclone, barbiturate pentobarbital are reduced by caffeine. Blood pressure can be increased in persons on beta-blockers propranolol and metoprolol. Serum levels of lithium are decreased by caffeine. In the case of sudden caffeine withdrawal, it can result in increased lithium levels and lithium tremors. Absorption and bioavailability of aspirin is increased by caffeine. Oral contraceptives, cimetidine furafylline, verapamil, disulfiram, fluconazole, mexiletine, phenylpropanolamine, several quinolone anti-biotics including enoxacin, pipemidic acid, ciprofloxacin and norfloxacin, idrocilamide and methoxsalen inhibit the metabolism and, or clearance of caffeine, thereby increasing its stimulatory effects. Pregnancy and Lactation: not to be used during pregnancy and lactation. 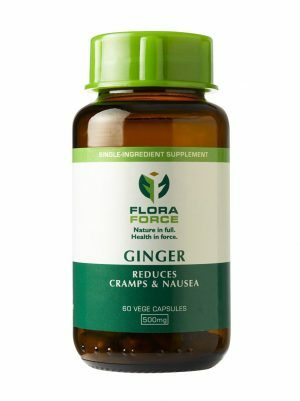 Dosage and directions for use: Take one to two capsules at bedtime. Do not use for more than 10 days without consulting a healthcare practitioner. Side-effects and special precautions: Prolonged use can lead to caffeine associated adverse reactions. Nausea, bloating, diarrhoea can occur in sensitive persons. Reduce dosage. Known symptoms of over dosage and particulars of its treatment: Cassia (senna): overuse can cause potassium loss in persons on heart medication leading to increased toxicity of cardiac glycosides. Can induce sennoside toxicity; severe abdominal pain with griping and inflammation, nausea, vomiting and severe (often bloody) diarrhoea. Treatment is symptomatic and supportive with fluids and electrolytes. Identification: Clear size 0 all vegetable capsule containing light brown to green herbal powder. Presentation: 60 Capsules packed into 125ml amber glass bottle with dark green screw cap and safety seal insert. Storage instructions: Store below 25ºC. KEEP OUT OF REACH OF CHILDREN. Registration number: To be allocated.